Development of hybrid organic/inorganic thin-film transistors with top and bottom-contact configuration using semiconducting polymers (P3HT, PQT12, PBTTT) deposited by means of the solid-phase Laser Induced Forward Transfer (LIFT) technique. Semiconducting pixels and lines were Laser printed onto pre-deposited source and drain electrodes formed on silicon dioxide/p+-type Si substrate. The transfer characteristics exhibited well-defined sub-threshold, linear and saturation regimes designating LIFT as a promising technique for hybrid organic/inorganic transistor technology. The laser printing of both silver source (S) and drain (D) electrodes and semiconducting organic layer (P3HT) resulting in operating OTFT devices was also successful. LIFT technique has also the ability to print multilayer films in a single step approach for the realization of organic thin film transistors (OTFTs) in top gate configuration. The main advantage of printing multilayer film in a single step is the guarantee of keeping all the initial properties of the interfaces between the different layers. The risk of damaging the layers is also strongly reduced. 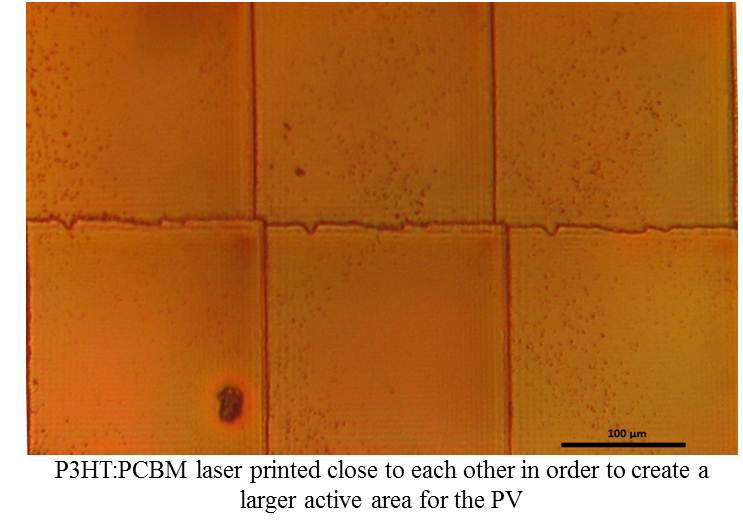 Solid Phase Laser printing of organic solar cells. Solar cell research is becoming increasingly important as the photovoltaic power industry experiences intense growth globally. Polymer-based organic solar cells offer the advantages of light weight, mechanical flexibility, and ease of processing, while their properties can be tuned by adjusting the chemical composition of the active layer. Deposition and patterning of polymer materials can be achieved by a variety of methods, most of which require liquid phase processing. Liquid deposition complicates the fabrication of all-organic, multilayer structures due to the interaction between solvents and materials from different layers. We achieve deposition of polymer materials in the solid phase, employing laser printing techniques, for organic photovoltaic applications. In order to form an active layer large enough multiple P3HT:PCBM have to be deposited. For devices with active areas in the range of cm2, we can print several adjacent spots to create a larger active surface, while simultaneously increasing the rectangular mask opening, which results in an increase in the individual spot dimensions. Adjacent deposition can happen in an automated way and create solar cells of any two-dimensional pattern possible.